After Harvey’s strong winds caused significant damage to the Corpus Christi area, the tropical storm has parked over Houston and deluged the city with historic levels of rain water. The Washington Post reports that at least eight people lost their lives. Major roads and freeways throughout the metro area have turned into wide urban rivers strewn with abandoned cars. 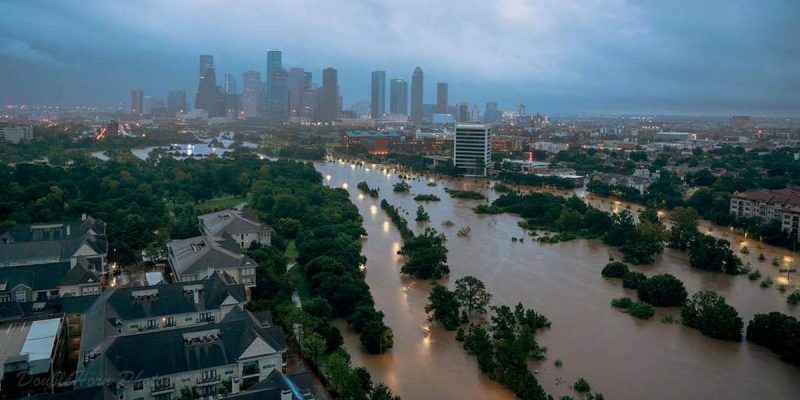 With these thoroughfares blocked, millions of Texans were trapped in there homes. 911 emergency lines have been barraged with such a high volume of calls that many have gone answered. The Mayor and Governor have consistently focused the emergency response efforts on one goal: saving lives. Despite the huge challenges, it seems at this moment, that emergency response agencies have been handling the catastrophe well. But Harvey’s rain continues to fall. The National Weather Service tweeted on August 27, 2017, “This event is unprecedented & all impacts are unknown & beyond anything experienced.” In the aftermath of the storm in weeks to come, Houston and the Gulf Coast areas will start to survey the economic losses. For now, everyone is getting a sense of the devastation from individual stories of loss. A childhood friend of mine, who had moved to Houston just two weeks ago, was caught up in the flooding with her husband and three children. They are safe, but every material thing they had is now gone. This story is so common, we will start to become numb to it in the next few days. Then the mind-boggling statistics will come out, converting these stories of individual loss into cold numbers. While we are still properly feeling the tragedy of this, we ought to pull out our wallets and throw something in the kitty. To help friends, you can create a Go Fund Me page. To find out how to help everyone else, FEMA recommends you go to the website of National Voluntary Organizations Active in Disaster (VOAD).